I’m not scared of flying in fact from a purely engineering point of view I think it’s a fantastic way to travel however that said I absolutely loathe the whole experience. Why oh why do you have to turn up at an airport not only hours before the flight is due to take off but sometimes hours before even the check-in opens. OK I know there is the security to negotiate that has become even stricter following the terrorist attack on the twin towers which incidentally in my view is just the kind of overreaction that I have come to expect and what the terrorist will see as a victory. Anyway back to the process of flying -let’s start with parking – bloody hell as if it doesn’t cost enough for flights especially long haul flights we are then charged a small fortune by the airport authorities to occupy a piece of concrete. Now I’m one of those people who checks in early – and to be fair it is a part of the system that has improved over the years – before running the gauntlet that lies between check in and taking a seat on the plane. Gauntlet is a word chose carefully because it seems that is exactly what it is. Starting with security checks themselves which start with either being scanned or even in most cases the ridiculous ‘rub down’ search where you are asked to stand – having first removed your shoes – arms out to the sides while what I can only describe as a cursory ineffective rub down is performed. I suppose having been a senior manager in HM Prison Service I know what a ‘rub down’ should be like if it is to be effective and airport ones as far as detecting if someone is carrying a weapon on their body are definitley not. Now I have no problem with security as such but one aspect of it that really gets up my nose is the ‘put any liquids etc in a clear plastic bag’ which has not to be more than 100ml because they never appear to query what the ‘decanted’ liquid is and if there are a group travelling together it wouldn’t take a great deal of effort to combine liquids to a level sufficient to cause a serious incident. The reason I touch on this is because I may not be someone with as Douglas Adams would have said “a brain as big as a planet” or the even brilliance of the late Stephen Hawkin but I can read and write which means I’m pretty sure I know what the security procedures are. Bloody hell fire the twin tower terrorists managed to train to hijack the bloody aircrafts themselves. However it isn’t the threat of a terrorist attack that puts me off flying but the other aspects of the whole experience starting with the experience of going through security and entering the departure lounge. I can see the point of having a number of places where you can get good quality food and drink, and even the duty free shop but please the number and range of shopping stalls in some airports is incredible. It is supposed to add to the holiday experience but I’m at a loss to understand how having to find a path through duty free – which now seems to be a part of the entrance – past people arguing about which particular bottle of duty free to buy. The waiting seems to go on until eventually hooray the call comes to queue once again at the departure gate and the joy of waiting for it to open and there we wait to embark the aircraft and prepare to set off. 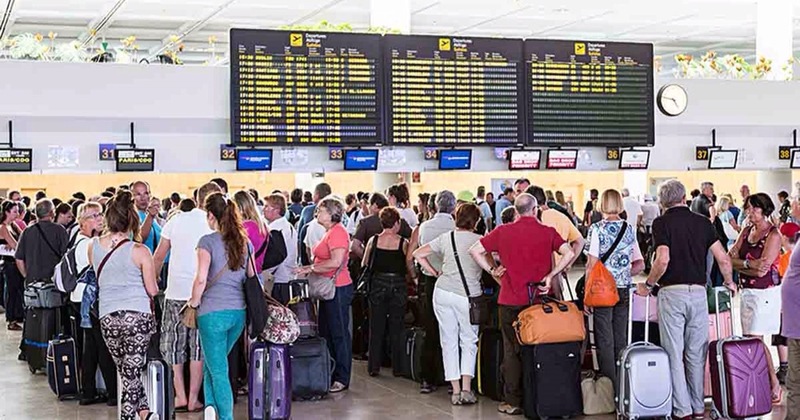 Except of course for the wait while the call goes out for those passengers who inevitably are still in the duty free shops or bars – in no other transport situation is there last, last, final this is the final call for passengers. Not if travelling by rail or road. And yes I know this is an aircraft and the fear of someone putting a bomb through to the hold and then not getting on the plane is a concern but no more than on a train or bus – or at least not to my mind. So there I am sat along with the majority of the other victims squeezed into our economy class seats ready to go except of course we have to wait for the morons who appear not to have been able to find their way through the duty free shop to the departure gate. Does the pilot not hear us silently screaming. “Close the doors and leave them behind ffs”? Clearly not and how many times is the FINAL call the FINAL FINAL CALL? Eventually they arrive and off we go to spend the next few hours – and if travelling as far afield as the other side of the world – a whole day in the company of total strangers some dragging and trying to placate their lovely little treasures who just happen to be monsters. Oh the joy of travelling. Whoever said it isn’t the destination that is important but the journey was a bloody liar. Oh how I’m looking forward to January and our journey to New Zealand.